Hundreds are still missing as the fire fighters battle to contain the fire. Twelve people have been confirmed dead and 18 people are in critical care after a huge fire destroyed a West London tower block on Tuesday night. Emergency services expect the death toll to rise. So far the 200 strong fire brigade have confirmed rescuing 65 people, but with tower block hosting close to 500 residents, it is expected to rise quickly. Hundreds of firefighters were sent to 24-storey Grenfell Tower in North Kensington, as smoke billowed above the capital after the blaze broke out in the early hours of Wednesday morning. The fire broke out not long after midnight and when many people living in the tower block were asleep. Witnesses spoke of “terrifying” scenes, with some residents suggesting they heard no alarm go off when the fire began. At least 75 people are being treated at six hospitals across the capital. Hundreds are still missing. A baby was caught by a member of the public after being dropped from a window as fire engulfed London’s Grenfell Tower, a witness has said. Samira Lamrani said she saw a woman gesturing to the crowd below that she was about to drop her baby from “the ninth or 10th floor” of the building. A man ran forward and managed to catch the baby, she said. The police are encouraging residents who have been evacuated to call the dedicated hotline so they can be put in touch with family members and make a head count. Eyewitnesses said some people may have been trapped in the building, which contains about 120 flats. London Mayor Sadiq Khan said fire crews only managed to reach the 12th floor at the height of the fire. Grenfell Tower was built in 1974 by Kensington and Chelsea Borough Council. It’s part of the Lancaster West Estate, a social housing complex of almost 1,000 homes, in the borough of Kensington and Chelsea. The tower block is near Westfield shopping centre in White City and the A40 – a major route for traffic entering and leaving the west of London. A two-year £10m refurbishment, which was part of a wider transformation of the estate, was completed by Rydon Construction last year. Work included new exterior cladding, replacement windows and a communal heating system. Kensington council have confirmed that several complaints following the refurbishment were received but fell on deaf ears. There was also extensive remodelling of the bottom four floors, creating nine additional homes, and improvements to communal facilities. 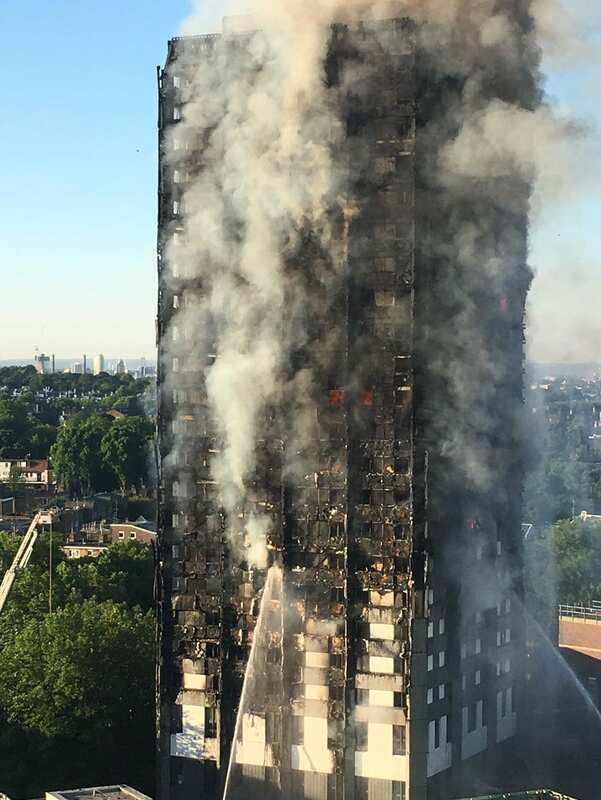 Since the huge fire in Camberwell calls for sprinkler systems to be installed in tower blocks have been made, but many buildings haven’t installed them yet. There has also been an outcry on advice provided in the tower itself, suggesting in the result of a fire ‘to stay within your apartment’ as the doors are fireproof and can withstand fires for an hour. People may have been trapped by this advice as the firefighters only managed to reach the 12 floor. The London community has got together in the wake of this devastating fire. Muslims awake for Ramadan might have helped save lives after noticing the horrific blaze at Grenfell Tower. Residents have told of how they didn’t hear alarms as the fire swept through the 24-storey tower block in West London. But they were instead alerted to the blaze by fellow residents, some of whom were Muslims who were awake early in the morning because of Ramadan and were among the first to notice the fire. Lots of people were still searching for friends and relatives who lived inside the tower. Many people have donated water, food and clothing to the nearby St Clement church, where locals have taken refuge. Others are distributing water bottles to those waiting outside. A full investigation will be taking place as the building stands in ruins. People are being advised by police to stay away from the area, where roads are closed. Falling debris has caused a number of flats in the area to be evacuated. NHS England is asking Londoners to use its services “wisely” and, if they need medical attention, to “seek advice from NHS 111 in the first instance”. An emergency number – 0800 0961 233 – has been set up for anyone concerned about friends or family. St Mary’s Hospital and Charing Cross Hospital have asked people to only go to their A&E departments in an emergency.